Many of the health problems we see today are linked to certain common ingredients in our food. Over the years, we’ve seen things like trans fats, artificial flavors, and high fructose corn syrup be exposed for their negative effects. But one ingredient continues to be used in thousands of products that Americans use every single day. The ingredient has been linked to every major chronic disease we see in modern society. And the food industry is addicted to using that ingredient the way a drug abuser is hooked on their drug! That ingredient is wheat. But what’s the alternative? Is there anything out there that has the ability to support a healthy diet and thwart wheat as the go-to ingredient? Read on, the answer is here. When we talk about wheat, the real "bad guy" in the room is gluten. You've probably heard that eating too much gluten is bad for you, but saying no to delicious, gluten-filled breads and crackers is tough! Here's some good news: avoiding gluten is a lot easier once you understand what it is and how it affects your body. Gluten is a type of protein found in several grains, but predominantly in wheat. It's part of a larger family of proteins called lectins. Lectins have some not-so-healthy qualities, especially when consumed in large amounts. Lectins bind to certain nutrients so your body cannot absorb them. Humans cannot digest lectins, so they have no real nutritional value. Lectins can bind to certain receptors in your intestine wall, causing everything from irritation to diarrhea. Why are lectins so harmful? Experts think some plants produce lectins as a toxin to keep animals from eating them. It's time that we humans listen to that message. The average person can eat small amounts of gluten without too much trouble. (Gluten-intolerant and Celiac folks are another story. Even the smallest amount of gluten can cause them a serious reaction.) The problem is that most people eat way too much wheat, and therefore way too much gluten. When you nosh on gluten day in and day out, your intestines can become chronically inflamed and angry. You might even develop a condition called leaky gut syndrome. Leaky gut is about as pretty as it sounds. The gaps between intestinal cells open up, and your intestinal contents leak straight into your bloodstream. This causes bloating, skin issues, food sensitivities, fatigue, brain fog... all symptoms that you and your doctor may struggle to find an explanation for. Then, there's the matter of gluten addiction. Maybe you've joked about being addicted to bread or cookies. There was more truth to your statement than you knew! Certain gluten peptides (tiny protein pieces) known as gliadorphins activate the opioid receptors — the same ones that respond to heroine or morphine — in your brain. It's no wonder you have trouble stopping after just one cookie! Researchers found gluten to be addictive in 1984, but that message has been slow to reach the public since the food industry is so reliant on wheat and has so much control over the "health" messages we get. Money talks to the powers that be, so people don’t always get full disclosure about what they’re ingesting. After all, wasn’t there a time that smoking was good for you?! So, how did something so bad for humans become so prevalent in our food? Since the colonial days, wheat farming has been a booming industry in the U.S. Wheat grows well in the prairies out west; many other crops did not. The food industry began using a lot of wheat because it was cheap and available. With the demand for wheat high, farmers produced more... and Americans became as addicted to wheat as the food companies. Big food companies have since been unwilling to move away from using wheat because doing so might eat into their profits. They can't have that. They would rather you suffer with leaky gut. In fact, a ton of misguided research and development has gone into making these ingredients even worse for our health! We’ll talk about the processes of “bleaching” and “enriching” in another article. There's another reason the food industry loves wheat. Gluten is a protein -- so using wheat is a good way to boost the protein content of food. Well-meaning consumers know to look for high-protein foods, so they jump on foods that contain plenty of gluten... without realizing it's not a healthy protein choice. The food industry has also led consumers to believe that the only way to enjoy breads, cookies, cakes, and pasta is if they contain wheat. This sad cycle of deception won't change unless someone takes action. The rebellion against wheat flour has begun. As a part of that rebellion, some alternative flours have become available for gluten-free baking. Each has its pros and cons. Cassava flour: is made from a tuber root. It's high in saponins, nutrients that work as antioxidants and anti-inflammatory agents, but it can give baked goods a funny consistency. Bean flour: is high in protein but low in starch. It's great for denser baked goods, but not ideal for lighter, airier items. Almond flour: is another high-protein option. It contains a lot of healthy nutrients like omega-3 fatty acids and vitamin E. However, it is also high in fat and calories. Coconut flour: is lower in fat than almond flour, and it's a good source of iron, vitamin E, and many other nutrients. It can cause bloating and gas for those with sensitive stomachs. It has many names; chickpea, garbanzo bean, Egyptian pea, Bengal gram. Whatever you want to call it, this humble little bean may just be the savior that rises up from the dirt and brings us back from disaster. It’s one that’s been cultivated for more than 5000 years. Long before the scourge of wheat infected our diet, this life-boosting legume was favored by successful civilizations throughout history - Greeks, Romans, and Egyptians. If the alternative flours above get a grade of “B”, high protein chickpea flour gets an A+. We believe it has the potential to revolutionize the baking industry, one cookie or cake at a time. That’s because chickpea flour is made from high-protein chickpeas, rather than from grain, so it is high in protein, gluten-free, and low in carbohydrates. Beyond that, it's chock full of iron, fiber, magnesium, and calcium — nutrients many people do not get adequate amounts of in their diet. And don't get us started on chickpea flour baked goods: light, fluffy, and so satisfying. Chickpea flour works well for vegan baking, too, thanks to its naturally high healthy fat content and rich flavor and texture. I know what you’re thinking……I’m in! Where can I get this?! There’s one problem. None of the industrial food giants (a.k.a. “big food”) will touch this stuff. The cost of chickpea flour is many times higher than wheat, so it will crush the profit margins of their highly processed products. 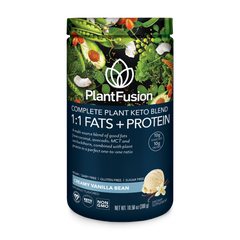 But PlantFusion isn’t a big food company. And our mission is to deliver the absolute best plant-based nutrition in a way that’s easy and delicious. So, are you ready to join us in taking action against wheat and the big food companies? 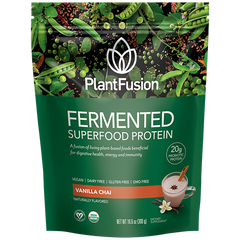 PlantFusion is creating a new, high-protein snack made with chickpea flour. Samples will be ready next month. If you want to be the first to give it a try, Click Here, enter your name and email, and put “chickpea” in the comments!